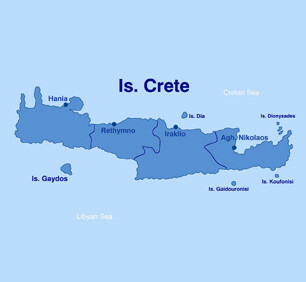 Crete is the largest of the Greek islands. On the south of Greece, near Africa, Crete, 245 kms long, lies between the Cretan Sea and the Libyan Sea. It was here that 4.500 years ago, the first European civilization was born, the Minoan civilization, which has left traces all over the island. The climate in Crete is mild and this makes for pleasant holidays at any time of the year. From Hania with its Venetian fortresses of Firka and Kastelli, Rethimnon, an old town full of mediaeval charm and the best preserved Venetian buildings, to Knossos the famous palace city of King Minos and Festos with interesting remains of Minoan civilization and of a Neolithic settlement, with its rugged mountains and enchanting beaches, Crete offers the visitor the unforgettable feeling that he has made the acquaintance of an island of a thousand faces. You can reach Crete from Cyclades and Dodecanese islands as well. The ports of Souda, Rethimnon, Hraklion, Agios Nikolaos and Sitia are very well protected. Crete is connected with many European airports and with Athens by plane and ship.